Last month, the Navy Recruiting Command completed its deployment of a recruiting system for notebook PCs to run under Microsoft Windows NT 4.0 that replaced an MS-DOS system. Recruiting Tools for the 21st Century, used by 4,750 enlisted recruiters and 300 officer recruiters, is more intuitive than the former MS-DOS system, said Lt. Cmdr. Denise Carraway, information systems director at the Navy Recruiting Command in Millington, Tenn.
'We can show technology for potential applications that they can use in the Navy,' Carraway said. 'We're handing [recruiters] these notebooks for three years,' she said. 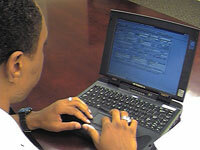 Through the General Services Administration Information Technology contract of Telos Corp. of Ashburn, Va., Navy officials have bought more than 2,000 notebook PCs from MetroBook Computer Corp. of Chantilly, Va. The service plans to buy 2,000 more MetroBooks over the next 18 months, Carraway said. The service is buying $2,300 systems running NT Workstation 4.0. The notebooks have 266-MHz Pentium II processors, 64M of RAM, 4G hard drives, 12.1-inch displays and Microsoft Office Professional 97, Carraway said. 'They are not your screaming machines, but they are decent,' Carraway said. Navy officials selected MetroBook in part because of budget limitations and because they have internal 56-Kbps modems and 24X CD-ROM and floppy drives, she said. 'We didn't want clumsy machines' that would force recruiters to use external drives, she said. Recruiters can run Navy videos for applicants. 'There are some battery limitations to using videos,' Carraway said. It saves battery life if recruiters use electrical power. Telos technicians replicate the RTools software image and third-party applications in their factory and download them onto each MetroBook, said Andy Johnson, the company's director of Defense Department programs. The Navy Recruiting Command began buying the PCs through the Joint Recruiting Information Systems Support blanket purchasing agreement contract with Telos, which was eventually dissolved because of lack of support among the services, Johnson said. The MetroBooks are replacing 2,000 Toshiba America Information Systems Inc. 400 notebooks with 75-MHz Pentium processors that the department bought in 1995 and 1996, she said. Each recruiting station is linked to a dial-in server where users can receive e-mail messages which are routed through RTools, Carraway said. Internet Service Provider Epoch Networks Inc. of Irvine, Calif., provides a toll-free telephone number for recruiters through a GSA IT Schedule contract, she said. Hot leads on potential recruits'received through the Navy's Web site, school lists and a toll-free phone number'are sent to recruiting stations based on ZIP code, Carraway said. Recruiters use a contact management program to keep track of biographic, education and family information, among other data. Recruiters can print part of the Navy app with the relevant data fields completed. To manage the data at the back end, RTools uses Sybase Inc.'s SQL Anywhere 5.5.00.